Without even yet releasing her first full length album London born singer Adele Laurie Blue Adkins professionally known as simply Adele has already gained a huge popularity both in her homeland and abroad. The singles Hometown Glory and Chasing Pavements are now the favorite songs of many people of different ages for at her nineteen years the artist demonstrates a profound wisdom expressed in seemingly simple lyrics. Adele has become the first to receive the Brit Awards prize Critics' Choice before her album was released and the British press has already called her as the new Amy Winehouse. The debut album 19 offering mostly heartbreak songs and ranging from jazz to pop is most probably only the beginning of a brilliant career for the voice of this young lady possesses enormous potentials which is surely going to be realized more and more in the future. The greatest part of 19 has been recorded with producer Jim Abiss who worked with Arctic Monkeys on its first creation, and consists of beautiful but far from simple songs. The album's first track Daydreams is a slow composition refined with silent guitars and Adele's amazing vocals singing a complicated melody in a melancholic way. A jazzy song Best For Last is one of the best tracks here for it is an example of how moods can change within a song never breaking its harmony. The single Chasing Pavements is evidently one of the leaders on the record for its beautiful catchy tune and big questions asked in the lyrics are close to anyone who has been in the situation of a breakup. Refined with an interesting instrument choice Cold Shoulder, a faster song, contrasts with Crazy For You, on which the singer's vocals are accompanied by a guitar solely but the composition's sound can be by no means called poor for Adele really makes miracles with her vocals. Melt My Heart To Stone is refined with an absolutely amazing magnificent chorus both due to the singer's voice and powerful orchestra arrangement and the most joyful song on the album is Right As Rain with a contagious rhythm. Produced by Eg White track Tired presents one of the most original songs here with a bass line that makes a great background for the singer's a bit husky vocals. 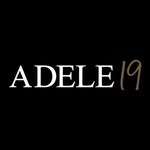 The album closes with Hometown Glory, a composition with a somewhat political flavor, a slow and wise piano ballad that showcases Adele's ability to sound soulful and a bit sad. The rich sounding of each single composition of the luxurious album that is 19 never let the listeners be disappointed with this young and wonderfully talented performer. Her original approach to music which indeed is a bit reminiscent of Amy Winehouse's works does create a style that is special, different from all the rest and concentrates in it the elements of jazz, soul, pop, funk and gospel. Yet beyond all doubt it is the singer's voice that has played the leading part in the success story. In order to feel completely all the gracious maneuvers the vocalist is able to perform it is not enough to content only with Chasing Pavements. The variety of moods on 19 has become a much wider territory that the unique singer's voice has easily conquered. Her independence of the others' opinion that exists not only in her creative work but in her life as well, for instance, she refuses to lose weight only for the sake of image, is heard on every composition pleasing with beautiful passes from joyful to sad, from slow to fast, from high to low. It goes without saying that this debut has made a furor, and, despite all the comparisons, Adele will not fail to make her name an example of success, too.